You can now update your Samsung I5801 Galaxy Apollo(Samsung Galaxy 3) to the latest Froyo 2.2 (ZHJPF). ZHJPF is an Asian firmware and has build date of March 2011. The next important point is to download the I5810ZHJPF_Complete_Package. Once you have all the things mentioned above you can now upgrade your Samsung Galaxy 3 to ZHJPF in a few minutes. Extract I5810ZHJPF_Complete_Package.rar file with the password "techgom.blogspot.com". On extraction, you will find a folder named "I5810ZHJPF_Complete_Package" inside that folder there will be 1 folder("I5801ZFJPE") and 2 files("apollo_0531.ops", "I5800_Odin_Multi_Downloader_v4.252.exe"). Click on OPS and choose the "apollo_0531.ops" file from the extracted folder. Click on BOOT and choose the "I5801ZFJPE-REV02-Bootloader-CL915488.tar.md5" file from the extracted folder. Click on PHONE and select the "APOLLO_FET_REV_00_phone" file from extracted folder. Click on PDA and select the "I5801ZFJPE-REV02-PDA-CL915488.tar.md5" file from extracted folder. Congratulations! 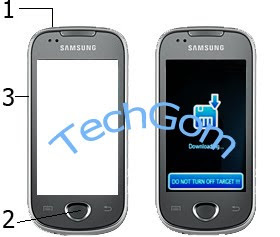 you have now successfully updated your Samsung Galaxy 3 I5810 (Apollo) to the latest 2.2 Froyo firmware(ZFJPF). If you wish to revert back to 2.1 once you get the official update from Samsung, Check Downgrading Samsung Galaxy 3 I5810 to 2.1 (DDJGE-INDIA) to know more on this. Just updated my Galaxy 3 to 2.2. Just wanted to know how to change the language? Its set to Chinese by default. Sure, I'll post some pics which will help you set default language to English. If you have any other issues do let me know. I have shown the procedure to set the Locale to English(UK) hope this will help you!! Let me know if you have any other issues..
Can we revert back to the original one after flashing using this method / Can we still use the official upgrade from Samsung after following this method??? yes!! we can definitely go back to 2.1, but for that we first need to know from which FW you are upgrading and then flash it with the same!! Once you are back to the original firmware you can then get the official upgrade from Samsung!! I really appreciate your quick response. Can you help me out with the process of reverting it? I am upgrading from 2.1, the one that came with my G3. How do I take backup and restore it? I'll provide you link for the 2.1 stock firmware if you want. Flashing that will revert your mobile back to 2.1. I'll post a tutorial to flash GS3 back to 2.1 soon. Mean while you can flash this 2.2 firmware. Let me know if you need the link. Can I use the FW provided at samfirmware.com for flashing back to 2.1? Do I need to take backup of anything to revert back? Will flashing cause any problems like losing IMEI number, changing Mac code etc? If so, is there anyway to recover it? yes you can definitely use it! Just remember to follow the steps mentioned in this post. Nope.. flashing wont change your IMEI number or any other details of your phone. Flashing is completely safe as long as you follow the instructions. Just want to let you know once the flashing is complete ur phone will restart immediately but you will get pass on odin after some time..
so kindly wait until you see pass on odin before you unplug the usb cable from your phone.. I'm sure you wont have any issues flashing..
Just want to tell you, when I open the Odin, it is displaying an alert, IMAGE PATH <>! Odin Multi Downloader has stopped working. Can I use the other one, which I downloaded from xda-developers? I'm checking it on my end.. I don't get such msg's each time..
sure no problem!! as long as it is the same version.. u wont have issues with flashing.. Still same issue, Odin Multi Downloader has stopped working. I just tried it on my end.. I get the msg's each time I select PDA, OPS, PHONE, BOOT etc. but don't get the stopped working msg. can u try one more time??? just go slow, wait the md5 file gets verified it sometimes can take longer time.. Thank you very much for helping me all the way. Gr8!! Congrats on successfully updating to 2.2 Froyo.. I hope you have changed locale to English(UK) as I shown in the post. Also let me know if you face any issues..
You can subscribe to my blog via rss feed or via email. Yeah.. I saw that image too.. That is really useful. My phone is fast enough now... But lost all my installed applications. Live Wallpapers isn't working. Can you help me with this one too? Live wallpapers is not supported by Galaxy 3!! The processor n ram are the culprit here..
Oops... I found one way of getting it done. Does "Voice Search" work in Galaxy 3? When I try it, it is saying "Connection problem". Let me know the performance of live wallpapers on Galaxy3 also the battery back up.. I am not using it continuously.... Will try and let you know. The Voice Search app is working sometimes (1 out of 10-15 times). Not sure why. Voice Search is working perfectly at my end!! Whenever I open the app, it is saying "Connection problem"
hey gautam thanks for the info. I updated to froyo using this guide and rooted my i5801. Do you know how to get rid of the preinstalled chinese apps? I tried some root uninstallers but i couldnt uninstall them. also how to update to the official froyo whenever samsung releases it? I have not rooted my Galaxy 3. So the pre-installed apps are still there. For getting the official froyo you can simply install the 2.1 rom on this. Once you do that u'll get the update from Kies. Strange problem with your Voice Search. Ensure that you are connected to internet via 2G/3G/Wi-Fi be4 trying voice search. I am able to uninstall all the Chinese apps using the root uninstaller. Can you provide me the 2.1 FW? I have downloaded the fw from samfirmware.com, and it doesn't have the files required for Odin. sure!! I'll give u link to 2.1 FW. are you facing ne problems with 2.2??? I suggest you to use 2.2 only!! Battery back up has also increased marginally.. But overall, my phone gained some speed after upgrading. Actually I have hell lot of problems with battery backup. Hope this upgrade solves them. after restarting the phone a couple of times i could uninstall those chinese apps. Also as of now i have not faced any problems with this 2.2 version. @gautam - does flashing 2.1 rom mean that use the procedure mentioned here and use odin to flash the 2.1 firmware (downloaded from samfirmware)? I have provided the instructions to revert back to 2.1 from 2.2. Is there any specific reason you want to downgrade to 2.1??? Let me know the problems you are facing if any.. I have had the least crashes on 2.2 (ZHJPF) firmware. Can u tell me for which apps you are facing problem(s)??? When I face the problem again, I will make a note of it and let you know. As it is upgrading via Kies is very painful IMO..
Not able open "Download Mode"...After I hold "power button + menu button + vol down button" simultaneously...I get 4 options:1.reboot system now.2.apply sdcard update.zip.3.wipe data/factory reset.4.wipe cache partition!!!!!!!! You are pressing the volume up button instead of volume down.. The menu that you are able to see is the recovery menu..
Kindly press volume down + menu button + power button to enter download mode..
Hi My Internet Browser doesnt work anymore. Cant open any websites though my data is working fine. Can update facebook, twitter everything but no sites open on the default browser. Please advise. Its strange!! No one else is facing this problem..
2. If that didn't help then you can turn off your mobile then, press power button + volume up button + menu button simultaneously, this will take you to the recovery menu..
2.2 You need to select the option "wipe data/factory", this will reset all data from your phone though.. Note:If none of the above mentioned steps work then you need to reflash the firmware.. This could be the result of a bad flash.. Thanks a lot mate , it works beautifully for me . also is there any way 2.2 can be rooted on galaxy 3 ? i m still using the original FW that i got with this phone. but the problem is it is extremely slow. i heard that flashing it to 2.2 will solve the problem. but i dont know how to flash it. i am not at all confident about doing it. This 2.2 firmware is very gud I'm sure u'll find performace improvement over 2.1. I hv provided the tutorial to upgrade G3 in this post..
You simply need to follow it n I'm sure u'll have no issues. If you still need my help I'll guide you through the process..
You can definitely root your Galaxy 3..
To do so follow the instructions mentioned here. Performance of 2.2 is really good when compared to 2.1 and this FW working great. @Tanay let me knw if you have ne issues while flashing.. Very clear instructions... Appreciate your help on this. Only problem i see is to setup Data connection. I do not see data connection icon after upgrading. Do i have to download the settings again? I am using Airtel - Andhra Pradesh. Yup! you need to get setting from Airtel. You can manually configure if you knw the settings from Settings->Wireless and Networks->Mobile Networks->Access Point Names and create a new apn. Let me know if you have any issues.. I already did :) everything works like a charm. I really appreciate your work.. Thanks again.. Between are you using Galaxy 3 as well? My brother is using Galaxy 3, I have a Galaxy S..
Is flash working on Galaxy 3? Even GPS isn't working when I uncheck "Use wireless networks"! It takes too much time and says "Unable to find location"
I'm not having issues with GPS.. Though I have tried it only with 3G on Tata Docomo..
Will it work with the official upgrade or not? Flash is not supported on Galaxy 3 processor. If Adobe includes support for this processor only then we will get flash.. I hav updated to froyo. ..
tell me is it possible to update my samsung galaxy 3 into 2.3 andriod ? You need to manually configure GPRS/EDGE/3G settings. You can send an sms(generally Toll Free) to your service provider(operator) who can send u the settings for your phone. Can you provide more details about which network you are facing this issue? As of now only Galaxy S will be getting 2.3 officially..
You can follow the instructions here to revert back to 2.1. I would like to know why you wish to revert back to 2.1??? It is only a setting issue. Once you get the rite settings you wont have any issues IMO. Do you see G or E in the bar at the top besides the signal strength indicator??? Can you use other applications that use internet?? Like gtalk, market, gmail, maps??? Well I have somewhat gud news!! Flash your cell back to 2.1 from here. As I just got confirmation that Samsung Galaxy 3 got a 2.2 official upgrade over Kies. You just need to flash 2.1 and then upgrade via Kies to 2.2 Froyo - India via Kies. You need to downgrade to 2.1 DDJP6 which is the original firmware for Galaxy 3 in India. Only when u do that you will get the update via Kies. Updating via Kies is very simple. Simply connect your phone to PC n start Kies. Kies will prompt you for a new software update. by the way where r u from ? You can check out the Must have apps on your Android!! I'll be making a new post for new apps on Galaxy3! You can subscribe to my blog via Email or RSS feed whichever you prefer, you can also follow my blog! for latest android, telecom, and technology related info!! i noticed that although you have stated in this guide that we are installing ZHJPF which is the latest, the download link above contains ZFJPE. JPE was compiled in feb 2011 and JPF in march 2011. so using this guide i have JPE now.. can you confirm this please? I understand you you are saying, the ZFJPE firmware size is 118.2Mb and that of ZFJPF is 118.3Mb. IMO ZFJPF has the same baseband as that of JPE but something must have changed or enhanced. I'll try to find out more info on this and get back to you..
Because of this thread I upgraded to Chinese Android image 2.2 to my phone. Then I found some issues and disgusting logo, app there. So I downgraded to Android India 2.1 flash image. I'm happy you got what you wanted! I'm sure with this Kies update you will no longer have any issues with 2.2.
do you know the firmware version of the official indian froyo update? I dont want to downgrade to 2.1 just for the indian update.... is their any chance that we can flash the indian update directly from the chinese version if its available for download? The official froyo update for India is DDJP2. This firmware is not available to download as of now. But it will be available in some time. My suggestion is if you are not having issues with ZHJPF then better wait till the ODIN firmware is available and then flash that firmware over existing 2.2(ZHJPF). I'll update once the firmware is available to download as of now Kies is the only way to update to 2.2 Froyo(DDJP2-India). Can you elaborate a bit more??? Did you downgrade to 2.1 DDJG6 by following instructions here??? Only when you downgrade your firmware you can be eligible for Kies update of 2.2 i.e. DDJP2. You can check the complete guide of upgrading to DDJP2 via Kies here!! Sure try that and let me know if ur still facing issues.. I have never used Videocon ever in my lyf! I will be the wrong person to answer that question.. But I guess you can manually configure your settings and should be able to use it..
Also if you have a laptop then you can use your mobile as portable hotspot and using Wi-Fi on ur laptop access your mobile's net without connecting the device to the laptop via USB! This feature is called Mobile AP and is present in 2.2+ Android OS. i get this error - the Swype package you installed is configured for another device and will work with limited functionality. please contact swype about this issue. swype was working fine on the chinese 2.2.. are you experiencing this problem? ZHJPF is much better than the official DDJP2 Indian update..
Let me know if you find ne other issues with DDJP2..
you can try and check whether you get that message..
btw you on JP2 or JPF? I'm currently on DDJP2 but planning to install ZHJPF again..
also please do mention here if you do flash back to ZHJPF.. I have not flashed custom ROM till now.. This rom looks pretty gud..
Quadrant score is 200 more than stock rom..
Will give it a try soon.. I'll still use DDJP2 for a few days!! Will let you know if I flash back to ZHJPF!! also let us know if you try out any custom ROMs(maybe with step by step guide). There are a couple of nice custom ROMs available for g3..
can I use this same guide for flashing to ZHJPF from DDJP2?? or do I need to follow any different steps as I am flashing from a froyo firmware to another froyo firmware. or do i need to flash the 2.1 DDJG6 firmware first and then flash to JPF using this guide. I am facing some problems with the DDJP2 firmware. swype is not working and I am geting some crackling noises when listening to music in the music player if i touch the screen while playing music. ZHJPF was working without any of these problems. No need to flash 2.1, You can directly follow the steps here to flash ZHJPF 2.2. DDJP2 seems to have some issues!! Swype is not working because there are no language packs installed on DDJP2. I'm unaware about the music player issue. Let me know if u face ne issues while installing ZHJPF..
i dont think samsung will be issuing any future updates or bugfixes anymore for the i5800/5801..
i will try flashing JPF when i get time...will report back...thanks..
Yep! Samsung wont be issuing any fixes for the DDJP2 any time sooner. I'm sure ZHJPF is a better choice at the moment..
i downloaded the DDJP2 firmware from samfirwares but it contains only one tar file and no PDA, BOOT, CSC files. how do i flash to DDJP2 firmware using odin without those files?? also is the ops file the same for i5801 for all firmwares? i found a guide here. is this the way to do it? do you know the difference between flashing using boot,pda,csc files and flashing by using one package? There is not much of a difference! You can follow my steps for downgrading 2.1 DDJG6 here, which is also a one file firmware to flash 2.2 DDJP2 which you have downloaded.. But if you are already on 2.2 ZHJPF then you need to first downgrade to 2.1 before flashing to 2.2 DDJP2. and some guys on xda-developers have posted the method to get swype working on JP2..
so if i get this correctly, from JPF i will have to downgrade to 2.1 and then update from 2.1 to 2.2 via kies or flash JP2 from 2.1 rite? Gr8! Can you provide link for getting Swype working??? Other ppl can make use of it as well..
Yup! You can either upgrade via Kies or flash using ODIN. ODIN method is faster IMO..
Let me know how the entire process goes.. I'm sure G3 users will be happy to know there is a way to make Swype working.. I am using Samsung Galaxy 3 I5801 and I upgraded the s/w to Froyo 2.2 recently. by which battery consumption is so more. Battery is dried very quickly. hey dude thanx a lot fr ur work.. m really very happy for this 2.2 ZJPF.. If you are using certain applications that need to be on to provide push notifications like yahoo, twitter, gmail, gtalk, etc. I hope you understand wht I'm trying to say here..
Also can you tell the applications with which you are facing this issue??? Its not very often that we restart our phones, n that image only comes when u restart your phone. I suggest instead of messing around with the firmware be happy with the way things are..
You can subscribe to my blog via Email or RSS feed whichever you prefer, also like my facebook page here, you can also follow my blog for the latest android, telecom, and technology related info!! @Gautam - Thank you for your response. GMail, GTalk, FaceBook, Gallery, etc are opening again and again. Could you suggest any secure android apps which can handle these problems. This is because your sync is on.. Disable sync to close Gmail, Gtalk and Facebook. Regarding Gallery I'll check and let you know! I have flashed my galaxy 3 with chinese firmware provided by you. But there is a problem that volume keys are not working to silent incoming calls. I have not tested if silencing incoming calls is working or not! May be someone who is currently on ZHJPF will be able to test and confirm it.. I'm currently on DDJP2 firmware! i tried flashing it over the rom but it didnt work....should i flash the eclair first n then zfjp3? are you facing any issues with indroid 3.0?? I have not tried flashing stock rom from a custom one..
Will give a try and let u know.. I m using the Indian version of froyo .So to get this chinese one should i revert it to 2.1? And wat all should i backup cos some of my apps are in the sd card?? No camera, GPS issues. Its smooth. But i felt my data connection becomes slow in this ROM.This may be a issue with my service provider too. Just wanna know anyone else faced this issue? I'll update if my speed becomes normal. I faced this issue in many firmwares (2.1 & 2.2). I'll use market.android.com in my PC browser to install apps to my device. It'll start download in my phone, once it reaches 100% it'll disappear. Nothing will happen at all. But it'll shown as "Installed" in my device market. But actually will not be installed or available to use. I want to flash my i5801 2.1 to ZHJPF. but my phone is rooted should i unroot or just flash my phone? It is always recommended that your unroot be4 flashing your phone!! If you are unable to do so you can directly flash to ZHJPF you will lose root after flash..
ZHJPF is a Chinese official version not official for India! It is a lot better than DDJP2! Hello, I updated to 2.2 on my g3. The battery drains very fast... Not even 4hrs backup I get. I downloaded fw from your link. I use my phone in 3g mode. On 3g battery drain is higher compared to 2g! How much back up are you getting with 3g always on??? Then press volume up + menu button + power button simultaneously! Once you see something on screen release the buttons. Now there will be a menu the second option will be to wipe data and cache. You need to navigate to that using volume down button. to select that option press menu button. Once you press menu button, it will ask you to confirm your choice and you need to navigate to yes and press menu button now simply reboot your phone!! NOTE: You will lose all installed applications, contacts, messages etc on your phone. Kindly take a backup of all necessary things be4 proceeding..
should i hv to root it before proceeding......???? You must have pressed volume down instead of volume up! Kindly turn off the phone by pressing the power button, then press and hold volume up + menu button + power button, You must see a recovery menu! Just take backup of your data like messages and contacts! using any application available on market! No need to root your phone for this! forced upload by key pressing.....???? Did u try turning off the phone??? If not turn off and try going to recovery mode! You are already on 2.2 rite??? You just get force close on opening music player? So now when you turn off the phone are you able to switch it on again??? As in turn on the phone normally(not in recovery)??? so wat wud u prefer ddjp2 or zhjpf....???? just try to do a factory reset from settings -> privacy ->Factory data reset and see if your music player issue gets solved! How to upgrade to froyo. I'm still on eclair. Pls tell safest way to upgrade to bug free froyo(because indian version has lot of bugs) without bricking my phone. what are the advantages of ZHJPF over DDJP2. i followed all the steps mentioned above and successfully flashed ZHJPF, its great. G3 has become much faster now and it is very stable. thanks for all the steps and for posting the details and reviews, it was of great help. I need a step by step inst like the above. Coz they said FugMod kernal and Indroid can give 1% of battery indicator levels. @gautam: u had asked me about battery life in 3g mode... I get not more than 3 hrs. Also battery gets heated up too much. Now it has also bulged a bit, as I have to struggle to put the rare panel. I use DOCOMO 3G KARNATAKA. @ Gautam : Hello Gautam,just updated my Galaxy 3 to 2.2.....the music player is not working,it stucks,freezes and crashes....had updated in via kies,then i had also flashed it using the firmware from samfirmware.....replaced the MusicPlayer.apk from /system/app using root explorer,tried 2 different new roms aswell,cleared the cache,hard reset it a dozen times,cleared the .flac files.....done everything....still no use.....can you advise me how to get this working???????? Try upgrading to 2.2 and see if the problem gets solved! This is mostly due to some software issue. i own GALAXY 3( GT - I5801) and it is getting reset(Factory data reset) every time it is switch off ( and On later). i have already updated my phone with zhjpf. there is not portable hotspot wifi option available in the teethering option also my phone is connected with kies. Can I update the indian 2.2 ddjp2 without downgrading to 2.1 via odin. Yes! you can directly flash Indian Froyo using ODIN, follow instructions mentioned here. You can follow the instructions for upgrading your Galaxy 3 to 2.2 Froyo using this link. If you have more questions, feel free to ask..
Can you provide download link for Odin multidownloader 4.252? Link above is not working. The file has been removed from depost files. Please post another link.